June | 2012 | Climate S.W.A.G. It’s easy to tell when the Salzburg to Munich train crosses into Germany. There is no visible border crossing, but suddenly solar panels are everywhere. Germany has been subsidizing the solar power industry for years…and it is the largest Solar power market in the world. Austria has been less generous, so the solar panels show up at the border. This experience underlines an interesting problem, Green Energy and geography don’t always work well together. Would you expect to find solar panels in Minnesota or southern Canada? All of Bavaria (southern Germany) has a latitude that is higher than Minneapolis. Munich, were it moved due west to Minnesota, would lie just a bit south of International Falls. Solar Power, International Falls, well.. uh…OK? Northern Germany has the same latitude as Southern Alaska. Roofs all over Germany are covered in Solar power panels. The efficiency of those units must be terrible. I can’t imagine climbing up onto the roof on a cold winter day to remove the snow so the solar panels can see the sun. Munich has only 8 hours and 21 minutes of daylight on December 21st, and the sun angle is 18.5 degrees above the horizon, the sun angle to the panels must be terrible. A wind farm has been constructed along I-65, north of Indianapolis, an area that is considered marginal for wind generation. 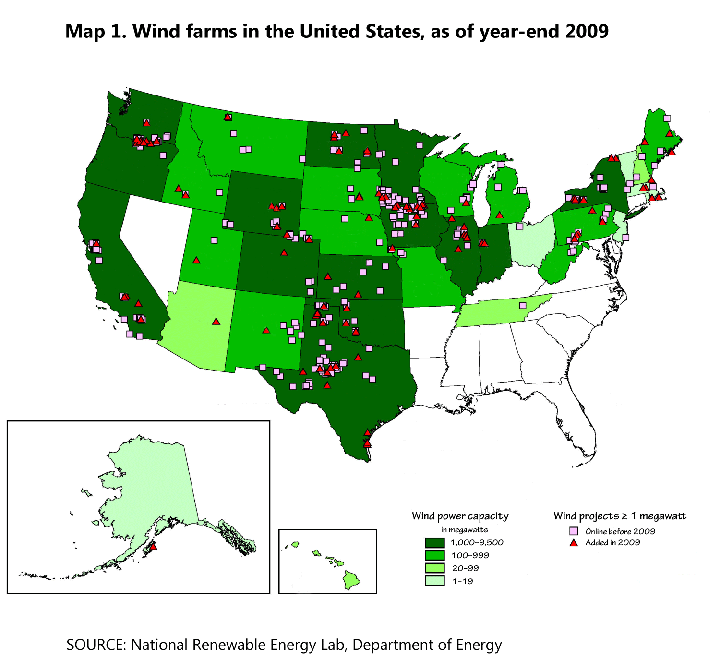 All of the Southeastern USA is considered unacceptable for wind power generation. When I think about wind power in the USA, I see very long transmission lines everywhere. Good wind generation locations are, for the most part in remote locations…like the middle of Lake Michigan or the mountains of Wyoming. Let’s look at some USA Energy department maps. We in the USA put wind farms at places that are acceptable politically and not too bad scientifically. The result is relatively inefficient wind farms. Whenever politics and science get mixed together we should all be prepared for strange results. Solar panels at latitude 48.1333 (Munich) and wind farms along I-65 in central Indiana (it’s not on the map because it was built after 2009) are just two of my favorite examples. Exit Glacier, Harding Ice Field, Kenai Fiords National Park. Ever hear of any of those places? 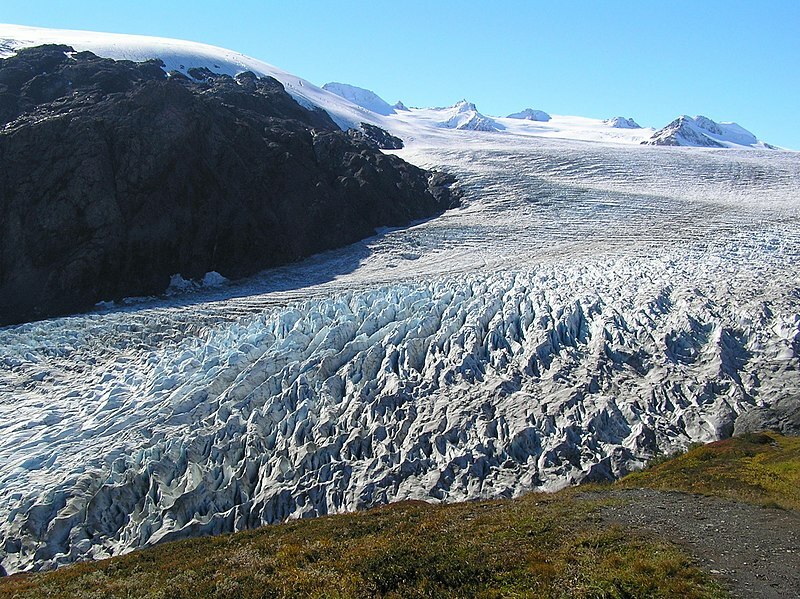 Exit Glacier is a mountain glacier in Harding Ice Field which is in Kenai Fiords National Park. Kenai Fiords National Park is adjacent to Seward Alaska, and only about 2 hours drive from my house. Exit Glacier has a small visitor center and trails that allow you to walk up next to the glacier. Numerical signs are visible along the 8 mile road leading into the park and along the trail from the visitor center to the glacier. Near the visitor center is the 1961 sign. The glacier’s melt edge was at that signs location in 1961. A half mile up the trail from the 1961 sign is the glacier….and a mile or more in the opposite direction, along the access road into the park, we can see where the glacier would have been in the late 1800’s. The glacier has been receding for 10,000 years. While on the trail, I passed a Park Ranger giving his global warming spiel. He was saying if we all worked together to make the planet a better place we could make a difference. It’s a nice thought…but is it really true. 10,000 years ago Exit Glacier would have filled the valley we drove up to get to the glacier, an 8 mile drive. Very nearly all that melting was caused by normal climate variation. Don’t get me wrong. I want to help the planet. I use energy efficient lighting, and try to eat local food whenever I can…but I worry we may be fooling ourselves. We can and should work to minimize our footprint on Earth, but we shouldn’t expect the results to really matter significantly in the grand scheme of things. Mother Nature holds all the big cards in this poker game. Is NASA Cooking the temperature books? I have long distrusted NASA temperature data. My distrust begins with Goddard Space Studies Administrator James Hansen. Dr. Hansen is a smart guy, but he has an agenda. He has been publicly trying to convince the world that global warming is a man caused crime against humanity since the 1980’s when he testified before Al Gore’s committee in Senate hearings. Anyone with an agenda is going to be scientifically prejudiced towards their preferred position, and Dr. Hansen clearly has a specific prejudice. Everybody working at NASA knows about the bosses prejudices….and I think that can and probably does impact results. Let’s look at some temperature data. First stop, the University of East Anglia, UK. The first two are surface temperature data, and the third is satellite data. All three are recognized worldwide as experts. Which one is not like the others? NASA! NASA data used to begin in 1860, and included the very warm years in 1878 and 1879 that are included in the East Anglia data. And that same old data had the late 1930’s and early 1940’s a bit warmer too. All current NASA data begins in 1880 and the links to data that went back to 1860 are no longer active. Both East Anglia and UAH show a pronounced peaking of data in 1998, NASA shows a much lower 1998 and a much higher 2010. The NASA data is presented in a way that makes it look like global warming is increasing steadily, the other sites show a peak in 1998 with slight cooling since then. NASA has insisted that 2010 was the warmest year on record with 2005 second and 1998 third. East Anglia and UAH like 1998. So who’s right? I don’t know, but I have suspicions. A second satellite site nicknamed RSS (Remote Sensing Systems), generally agrees with East Anglia and UAH. I wish NASA Administrator Hansen were less emotionally involved. He is a global warming true believer, and I fear his attitude may cause NASA to look for a specific outcome. Last week ABC News and the UK’s Daily Mail ran stories about a new scientific study showing that super volcanoes can form much more rapidly than previously thought. My local paper did not cover the story….but had space to talk about the looming catastrophe that was 400 parts per million of carbon dioxide in the atmosphere (my last post). One (global warming) might slowly change the world, making it warmer, which might lead to disaster, if the theory is right. The other (a super volcano eruption) will kill millions instantly, when it happens and it will happen. Scientists, could be wrong about super volcanoes, but there is lots of physical evidence (Yellowstone National Park for one) to support their view. Climate doom Sayers are relying on computer models and the output of those models are less consistent than their advocates would have you believe. Which boogie man scares you more? Yup, when I think about ecological boogie men, I think about Yellowstone blowing it’s top. It probably happened 640,000 years ago…and it has erupted 3 times in the last 2 million years. I have trouble imaging what the world was like 74,000 years ago, but it must have been awful. The 1980 Mt. St. Helens eruption times 2200. Imagine if you can, 640 cubic miles of material being ejected into the atmosphere in an instant. Many scientists think that is exactly what happened 74,000 years ago when a super volcano erupted in Indonesia. It was the biggest super volcano eruption in recent geologic history. The Indonesia eruption was estimated to be almost three times the size of the last Yellowstone eruption, which ejected some 240 cubic miles of material. The Yellowstone eruption (according to a BBC article) was like having 1000 Atom bombs going off every second. Now consider this, the day before the volcano erupted, the world was in the middle of an ice age cool cycle. Thousands of feet of ice blanketed upstate New York. The world survived the event, healed itself and became the world we have today. When I hear Al Gore or James Hansen talk gloomily about a tipping point with carbon dioxide, I have doubts. If the world can survive super volcanoes, and all the crap (including huge amounts of carbon dioxide) they put into the atmosphere, maybe Mr. Gore is wrong. Maybe the world can adjust to increasing carbon dioxide in the atmosphere. I suspect Mr. Gore and Dr. Hansen underestimate Mother Nature, and overestimate man’s ability to mess things up. When I think of a tipping point, I think of nature’s tipping point, Super Volcano eruptions. Imagine if you can, so much ash in the air that there was no summer until it subsided. Throw in acid rain and a sudden increase in carbon dioxide levels too. If the Earth survived all the ash and carbon dioxide and sulfur that was the Lake Toba, Sumatra, Indonesia Super Volcano eruption 74,000 years ago, maybe 400 ppm of carbon dioxide in the atmosphere ain’t so bad. Years ago, it passed the 350 ppm mark that many scientists say is the highest safe level for carbon dioxide. It now stands globally at 395. The highest safe level, give me a break. That is wild speculation and an extremist view. Most global warming hawks would be happy if we could get carbon dioxide to stop rising before it reaches 450. And many scientists think all this carbon dioxide boogie man stuff is crap too. We live in an Ice Age cycle, a little warming is probably a good thing. Carbon dioxide is not the chief greenhouse gas, water vapor is. Most, not some carbon dioxide is naturally produced and forest fires and volcanoes are significant natural pieces left out. Man produces about 3% of the total. Yes, carbon dioxide warms the atmosphere more than it otherwise would, but the amount that is optimal is always a SWAG and it’s impact on climate is theory….not a fact….and there is scientific disagreement on this subject…but not at the AP. I like to look at the National Snow and Ice Data Center Web Site. I was looking at the data presented and I noticed something that seemed odd to me. So much of the data was outside the shaded area of the chart which was labeled as a + or – 2 standard deviation area. In a normal distribution, over 95% of the data should lie within the shaded area. Then I finally figured out what was going on…. the standard deviation data was old data. Why did they do that? Yes I know it was right in front of me the whole time, but I wasn’t paying close attention. I hadn’t noticed that the data set that calculated standard deviation and average was based on data that ended in 2000. So when I made a post touting April as just about average for the 34 year history of the data, I was wrong. 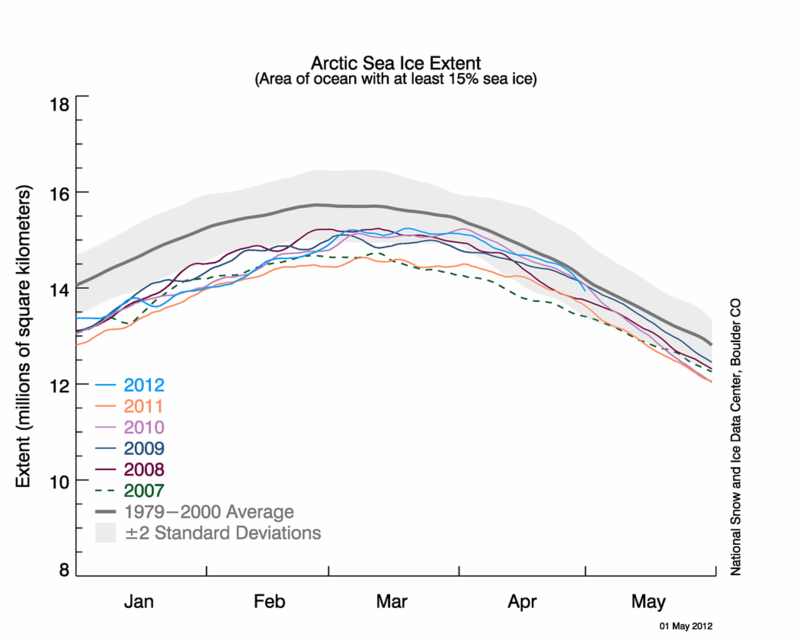 The Arctic Ice sheet was bigger than average in April of 2012. OK, a 34 year ice sheet data set doesn’t mean much, the data set is too small…but it’s bigger than a 21 year data set….60% bigger! 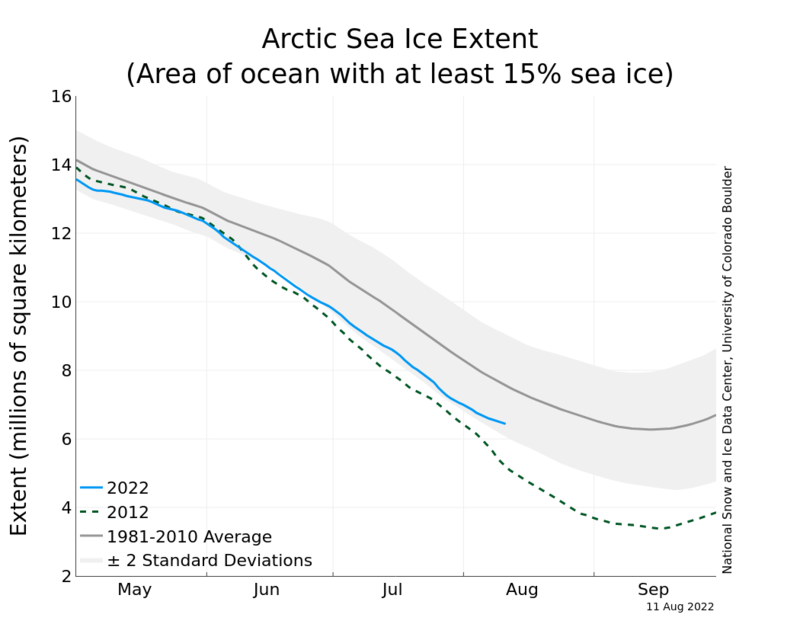 We know that the Arctic Ice Sheet summer melt peaked in 2007. We know data between 2000 and 2007 would have been less than average, and all data since 2007 has been warmer (less ice) than the average. It’s safe to assume that if a 34 year data set had been used instead of a 21 year data set, the average would have been a much lower number, and the shaded area that was 2 standard deviations would have looked different too. So April of 2012 was not average for the data set, is was average for the last 21 years of the 20th century and much colder (more ice) than the average of the entire data set. I am used to people making grandiose statements about Arctic Ice from small data sets. And really a 21 year data set or a 34 year data set doesn’t mean much in the grand scope of climate cycles that last millions of years…but it is an interesting manipulation of statistical data.